This month in the Museum’s Collections department we have continued to comb through our entire collection, trying to get an accurate picture of exactly what we have before we pack it away in preparation for our move to the new museum. We are still trying to make sense of the “edgier” objects in our collection: stuff, for the most part, acquired long ago and whose presence in our local history collection is… mysterious (you may have already seen my blogs about our Abe Lincoln top hat and our relationship with Calamity Jane’s secret daughter). Ever since I started work here I’ve seen this box labeled “Babylonian Tablets, 4,000 years old” at the back of a cabinet, in a room reserved mostly for taxidermy and rocks. Peeking in, I could see what looked like four cute archaeological miniatures, souvenir size. Their banishment to this dark niche made me assume these pieces were illegitimate and inauthentic, and that the marks on their surfaces were only cuneiform-like. I never had the time to research their story. Recently, though, Collections Assistant Ashley Houston and I started talking about these nutty things, and she mentioned that CSU has one that looked just like ours and that they treated it as totally “legit.” I decided it was time to take the time. Well, it turns out ours probably are legit too, and their obscurity in our collection comes from the fact that they seem to have absolutely nothing to do with the local history it is our mission to interpret. Not in a straightforward way, anyway. But their records reveal that these little pieces have a pretty interesting history, local and international, of their own. The four tablets were donated to the Fort Collins Pioneer Museum in 1941, from the collection of C. P. Gillette. A little research reveals that Clarence Preston Gillette was Fort Collins’ first entomologist. He was an internationally respected authority in many buggy subjects, known especially for his work on bees. He headed the Entomology and Zoology department of Colorado State University (then Colorado Agricultural College) in the late 1800s, and the school’s Agricultural Experiment Station in 1911. Gillette established the school’s insect collection as a resource for teaching and research, and continued to curate and expand it until about 1931, assembling a collection excellent in both its breadth and quality of material (this collection still exists, bearing its founder’s name, see http://www.colostate.edu/Depts/Entomology/museum/) . The Fort Collins Pioneer Museum acquired Gillette’s Babylonian tablets as part of a strange collection of interesting objects: the four tablets, an ornate copper spoon from the Pacific Northwest, an ivory yarn reel, two Pueblo pots, and two dinosaur gastroliths. None of these things have any connection to Gillette’s field of entomology and our records don’t help to reveal one. Still, it is easy to believe that, given the value he placed on collections in his own field, Gillette would have been eager to help expand the breadth of his local museum’s resource as well. Along with the tablets, Gillette provided the Museum with a letter of authenticity signed by “Edgar J. Banks,” detailing some information about their origins and meanings. It turns out that Edgar J. Banks is a name that appears in artifact records of institutions throughout the United States; its appearance in ours makes the Fort Collins Museum & Discovery Science Center a member in a sort of “Edgar J. Banks Inappropriate But Amazing Artifact” club. Edgar J. Banks started his professional career as an archaeologist. He spent many years excavating at an ancient Mesopotamian site called Bismaya, located in what is now Iraq. Historical opinions of Banks range from smarmy artifact looter to a “Johnny Appleseed of ancient history” (Ramsey Campbell of the Orlando Sentinel). He apparently had troubled relations with Harvard (where he pursued a PhD), the University of Chicago (which in 1903 sent him to excavate Bismaya, but asked him to resign from the expedition after one field season), and with Ottoman Empire government officials over his unlawful exportation of artifacts. Though the allegations which led to Banks’ removal from the Bismaya Expedition may have been (at least partially) false, his academic career never recovered after the incident and he left academia for a career as an antiquities dealer. Operating out of a gallery in New York City, Banks obtained artifacts of the Ancient Near East and, throughout the 1920s and 1930s, sold them for as little as three or four dollars a piece. 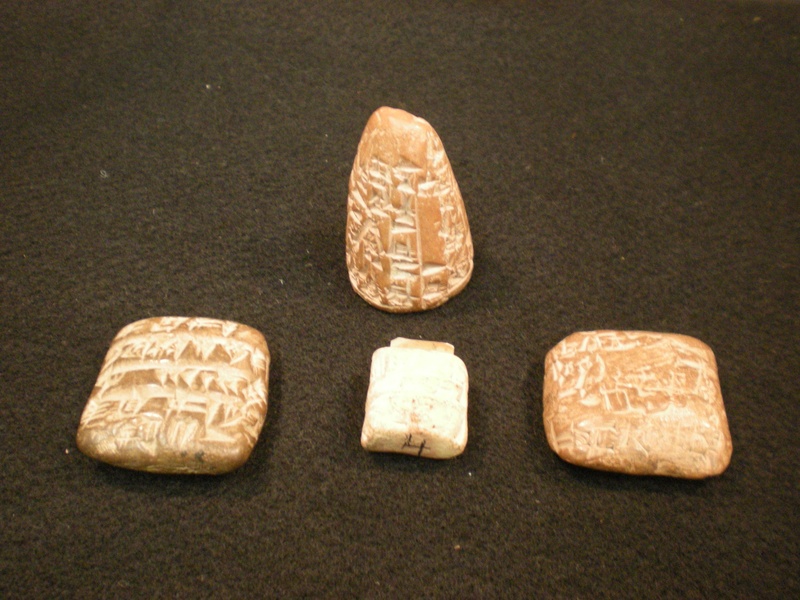 He stayed very busy at this trade: it appears that the four tiny tablets in our collection are among about 175,000 ancient artifacts which Bank sold to universities, libraries, museums, and private collectors throughout the United States! Even though Banks’ methods and practices were questionable, the authenticity of the Museum’s tablets’ age and cultural identity is most likely sound. Many institutions have confirmed that though Banks never liked to reveal the specific source of the material he traded, he did have the connections and expertise needed to obtain and identify legitimate artifacts of ancient Near East culture. So. Gillette (not an archaeologist) must have purchased his Babylonian tablets from Banks (oops, not an archaeologist either, as it turns out), maybe while on a trip or even by mail order. They were donated on Gillette’s behalf to the Fort Collins Pioneer Museum even though the Museum (not an archaeology museum, but already displaying ancient artifacts of North American cultures) did not focus on collecting or interpreting ancient Mesopotamian culture. The museum we are today, the Fort Collins Museum & Discovery Science Center, doesn’t either and as its Collections Curator I definitely don’t put my energy into acquiring ancient artifacts of Near Eastern origin with iffy provenance. But having learned their story I feel good about having these little tablets in our collection: they reflect the breadth of interests held by a renowned member of our community. What’s more, the cuneiform writing they bear provides us a first-hand glimpse back four thousand years to the world’s oldest written record of language, which is understood by most to be a definitive aspect of human-ness – in Fort Collins as well as in the rest of the world. Check out this fantastic image of physical fitness for women during the early 20th century. It’s from the Archive’s oversize photograph collection and dates to the early 1900s. The caption on the back of the original photograph states that the ladies are from a gym class at Colorado Agricultural College, present-day Colorado State University. Well, Spandex it is not….but it still looks like these ladies meant business when it came to fitness.